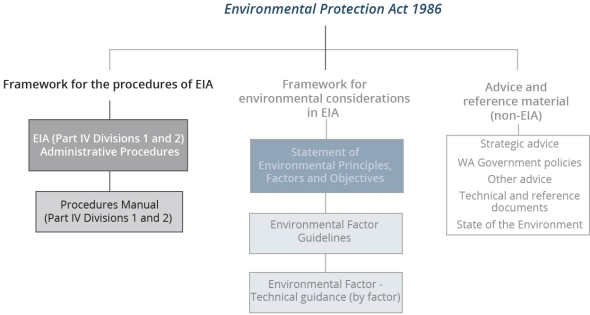 The Environmental Impact Assessment (Part IV Divisions 1 and 2) Administrative Procedures 2016 (Administrative Procedures) form part of the EPA’s framework for Environmental Impact Assessment (EIA) procedures for proposals under Part IV of the EP Act (highlighted in the figure below). The scope of the Administrative Procedures are the procedures that the EPA administers, either as a decision-maker or a delegate of a decision-maker. These Administrative Procedures also relate to changes to proposals and conditions after an implementation statement (Ministerial Statement) is issued. Stage 5 Deciding if proposal may be implemented and implementation of proposals (s. 45 to s. 48). The EPA’s Procedures Manual (Part IV Divisions 1 and 2) gives more detailed guidance on the processes and procedures for EIA of proposals under Part IV of the EP Act.